Surveillance, or sports action - whatever your purpose, The OmniCam mini video camera DVR kit is your best bet for best video capture results every time! The OmniCam mini camcorder DVR kit is actually two units in one. First, it's a top of the line extendible 1/3 inch Sony CCD lens and microphone attachment. Second, it's a first class digital video recorder (DVR) + multimedia player. Plug the lens attachment into the DVR body and the world is yours! 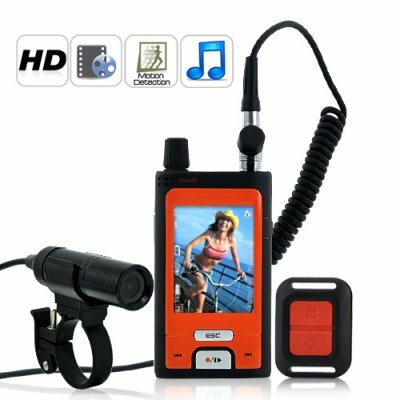 Multimedia Player: Because life should not be all work and no play, The OmniCam is also a sensational multimedia player that effortlessly plays the following video, audio, and photo file formats: AVI, MP3, WAV, and JPG. The OmniCam brings more to the table in terms of quality and features like a bigger screen size and support for high capacity TF microSD cards up to 32 GB. Yesterday I received this camcorder. Very rich equipment mounting the camera itself, is very fast and convenient interface for managing and viewing video footage. The image quality to CCD 480TVL quite acceptable, the compression quality is certainly not very high, but for use as a secondary camera is very good. Very good idea with a wireless remote control with radio - really handy when installing a camcorder inaccessible place. The quality of construction of the body is high and is nice in the hand thanks to rubberized casing. I bought it for flying paramotor for capturing unusual angles. Very good choice for this sport.